A magnificent grassfed prime rib. Our ancestors prized the fat in meat. Humans have raised beef cattle on grass for thousands of years, and they always tried to raise them to be fatter. Incredible breeds were developed over the centuries, cattle that fattened well on good grass and provided tender, delicious, meat; full of the nutritional benefits of grassfed fat. This beef was prized and loved. Then two events happened that denied most of us access to this wonderful meat. The first, starting mainly after World War II, was the widespread adoption of fattening cattle on grain, starting out with corn grown by artificial fertilizer, then leading to the use of soybeans and other substances, and resulting in a system where most cattle were taken from the pasture and sent to a feedlot to be fattened with foods that were never part of their natural diet. This resulted in a change of the very composition of the fat of the animals, and a great decline in taste. The second was the false belief, almost universally held to be true, that eating animal fat increased cholesterol levels in the blood, causing heart disease. We now know, from extensive research, that this was never true. But this false belief led to the demonization of all animal fat. Meat was routinely trimmed of all visible fat, and leaner meats were widely claimed to be healthier. When I started eating grassfed beef, and learned how to cook it, I was amazed at how good it tasted, and how much better I felt after eating it. Yet I immediately ran into the problem that grassfed meat providers trimmed most if not all of the fat off the meat, and most tried to make a selling point of how lean their meat was. This began a constant struggle to try to get grassfed meat with more fat in it, and more fat on it, a struggle that continues to this day. Throughout this period, I had one solid, superb meat supplier, and I was able to get fattier grassfed meat from them, and it was wonderful. Yet I was unable to get an old style grassfed roast, with a thick cap of its own glorious fat, and ample marbling. Until recently. 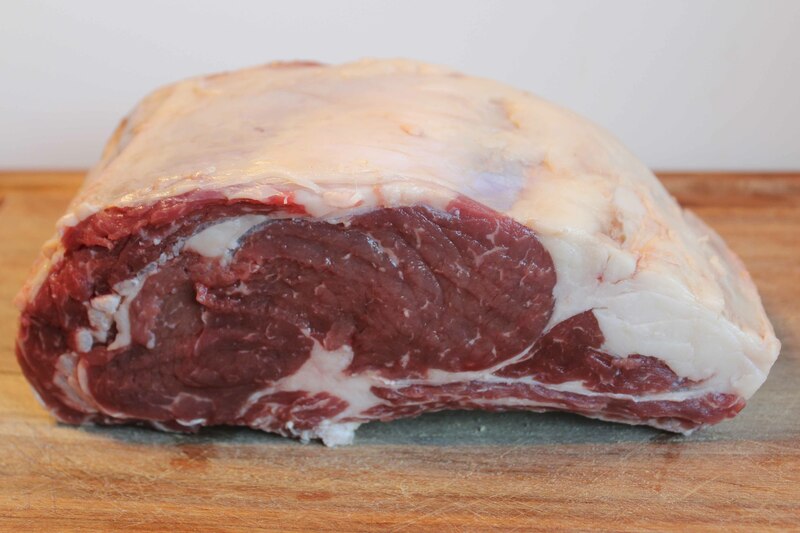 This raw grassfed prime rib has a thick fat cap that will flavor and tenderize the meat. Note the beauty of the raw prime rib roast in the photo above. That is a magnificent piece of grassfed meat. The tiny steaks of white fat in the meat are called marbling, and the flavor and tenderness they provide to a roast when they melt into the meat has to be tasted to be understood. 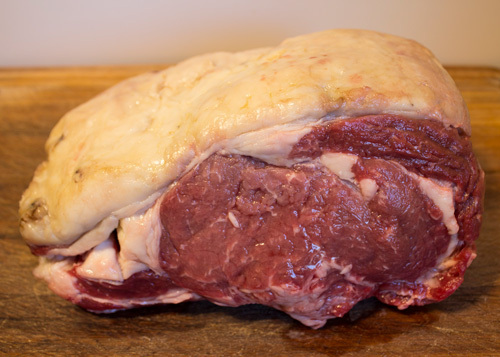 The thick cap of natural fat covering the roast is known as the fat cap, and it melts over and into the meat as it cooks, basting it, and making it even more tender and delicious, and preventing the meat from drying out. This is a roast that our ancestors would have appreciated, the kind that was recommended and celebrated in older cookbooks. 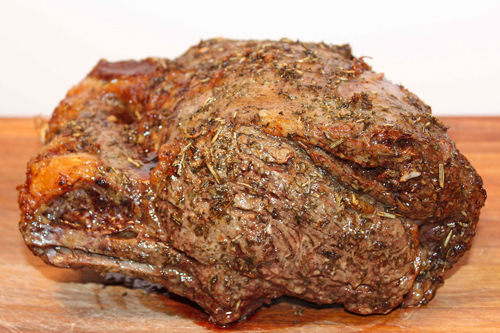 The photo at the top of the page shows the same roast, after it was cooked, just prior to being carved and enjoyed. The photo shows the beauty of the roast, but it cannot recreate the wonderful aroma, the tenderness of the absolutely delicious meat, the feeling of joy and satisfaction as it was tasted. It felt so right, so familiar, somehow. The roast was marinated with a combination of four traditional ingredients, all of which helped bring out its superb natural flavor, and slow roasted on a pellet barbecue using oak as the wood. Very easy, very simple, utterly tender and delicious. I recommend cooking a roast this fatty, medium rare (to around 130 degrees), rather than rare. This allows the fat to melt into the meat, which gives it that characteristic prime rib flavor and tenderness. The success and popularity of the Ketogenic movement, which appreciates the value of good fat, is making fatty grassfed meat more popular. One of the secrets of great cooking is to get great ingredients. This roast was obtained from my favorite meat supplier, U.S. Wellness Meats. If you want to try it, here is the link. Be sure to ask for a “high fat prime rib” in the Note section of your order. I will not receive any compensation if you order this roast. I am disclosing once again that I have a long and excellent relationship with U.S. Wellness Meats, going back eleven years. They were the first provider to sell me grassfed meat that I could make tender, and I have ordered regularly from them ever since. The founder of U.S. Wellness, John Wood, encouraged me to write my first grassfed cookbook, and bought a number of copies when it first came out, and sold and helped publicize the book. I am proud to call him my friend, and I have other friendships with some great people in the organization. They still sell both of my books, which they purchase from me. That said, our relationship would never have been close if they had not provided me with so much excellent meat, over so many years. And the photos speak for themselves. 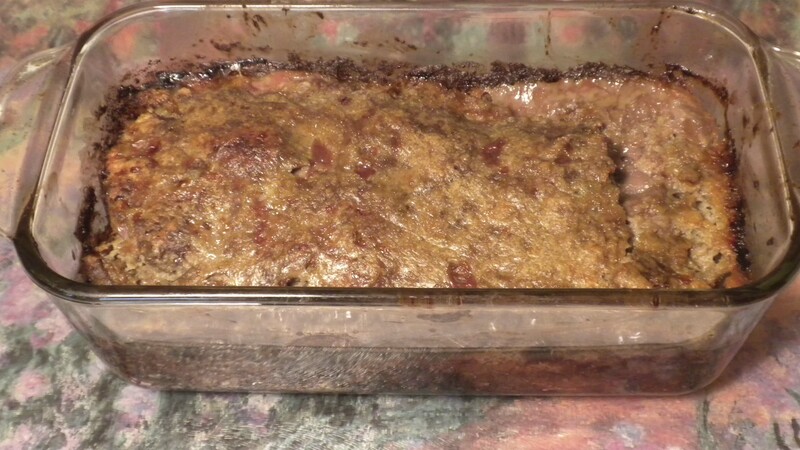 Delicious meatloaf made with U.S. Wellness Meats grassfed liverwurst. I am often asked for recommendations as to a good place to buy grassfed meat. At this point, I have one answer, when it comes to the Internet. Back when I wrote my first book, Tender Grassfed Meat, I decided that I would recommend a number of good sources of grassfed meat. I would not favor any particular operation. That was almost nine years ago, and I have changed my mind. The very first good grassfed beef I received was from one supplier, and that supplier has been so superior to everyone else that I have decided to give them the recognition they have earned over the last nine years. That supplier is U.S. Wellness Meats. The reasons are many, and here are the most important ones. The meat is grassfed, has enough internal fat to be tender and delicious, and is raised with skill and knowledge. Quality has become a huge problem in grassfed beef nowadays, as the increasing demand has led some farmers who do not know how to finish grassfed beef into the market. These farmers often produce meat that is so lean and poorly finished that it will never be tender or delicious. It takes a great deal of skill to properly raise and finish grassfed beef, and the farmers who raise beef for U.S. Wellness Meats have that skill. While the price of other grassfed meat has skyrocketed during the last few years, the prices at U.S. Wellness Meats have risen much more slowly. Not only are the regular prices lower than almost everyone else, there are sales every two weeks that give you fifteen percent off everything. In addition, shipping is always seven dollars and fifty cents. And additional discounts are available when you buy in bulk. I have ordered meat from U.S. Wellness Meats literally hundreds of times over the last nine years. Most orders are perfect, and in the very rare event that something goes wrong, they have always made it right. They are more reliable than anyone else I have used. Every one of the thousands of pieces of meat I have bought from them has been tender and delicious after I cooked it. Much of the grassfed beef sold by U.S. Wellness Meats is imported from Tasmania. It is important not to confuse this magnificent meat with other beef imported from Australia. While some of the grassfed beef imported from Australia is of mediocre quality, beef from Tasmania is different. Tasmania has incredibly rich soil and grasslands, and the grassfed meat it produces is superb. In fact, it is just as good as the best American grassfed beef, in my opinion. If you are committed to only eating grassfed beef, you cannot help but notice how much more expensive it has become over the last few years. But U.S. Wellness Meats has deliberately held their prices down, making superb grassfed beef available to many people who could not otherwise afford it. True, this does give them business advantages, such as customer loyalty, and taking customers from the more expensive sources. But it does serve our community by making grassfed beef much more affordable. At this point, they are the best price choice available to me, and I deeply appreciate their commitment to the grassfed movement, taking the long view rather than trying to grab as much short-term profit as possible. In my view, they deserve our support, and I will happily continue to buy their meat. I usually order by telephone, and I have had the pleasure of much interaction with the people at U.S. Wellness Meats. Without exception, they are well informed, pleasant, helpful, efficient, good to talk to, and they get the job done right. This is the best group of elite workers I have ever worked with, in my entire life. It is always a pleasure to deal with them. While I have focused this article on grassfed beef, U.S. Wellness Meats has a vast array of other fine products, including grassfed lamb, grassfed bison, pastured pork, pastured chickens, pastured ducks, even excellent frozen shrimp and other seafood. They also make excellent grassfed beef sausages with only good ingredients, including the best organ meat sausages I have ever come across. While they produce several fine organ meat sausages, I consider their liverwurst, made from grassfed liver, grassfed kidney, and grassfed heart, to be one of the most nutritious products I have ever purchased. These organ meat sausages make it easy to enjoy the benefits of organ meats. They also make some very fine bacon, with only good ingredients, and many other fine products, including grassfed beef tallow and other healthy fats. For these reasons, I recommend U.S. Wellness Meats as the best choice I know for purchasing grassfed meat through the Internet. Our ancestors used food to prevent and heal disease, and to maintain their natural functions. They did not have the benefits of scientific studies, but they did have the benefits of experience, knowledge that was passed down from father to son, mother to daughter, master to apprentice. Cultures as diverse as the ancient Chinese, ancient Greeks, many African tribes, and Native Americans connected the eating of a certain animal, and body part of a certain animal, to heal and benefit various organs and parts of the body and mind. This practice continued into the twentieth century, with some medical doctors using some of these traditions to help their patients. There is a logic to this practice, as the nutrients the animals needed to maintain and nourish their organs were likely to be found in that particular organ. Scientific research has confirmed that organ meats are very rich in vital nutrients. I do not know of research that has supported the idea that eating the particular organ of an animal would prevent or heal disease in the same organ of the person who ate it. Of course, modern medicine does not use these methods, relying mainly on drugs, surgery, and radiation. Eating the heart of a strong, healthy animal was believed to help maintain the health and strength of the human heart. The Native Americans placed special value on the heart of a young stag, for this purpose. In the early twentieth century, some doctors in the U.S., used to advise patients with heart problems to eat beef heart as a way to strengthen their own heart. Many peoples believed it was beneficial to eat the brains of an animal, and that this would make them more intelligent and sharpen their minds. The liver was particularly prized, all over the world. Hunters would often eat the raw liver of their kill on the spot, as it was felt to be the most beneficial at that time. The hunters would divide the raw liver among themselves, so all could get the benefits. It has even been documented that the first part of the prey eaten by a predator, such as a lion, is the liver. Eating the liver was believed to make the liver of the eater stronger, and to purify and cleanse the body. Science has confirmed that cleansing and detoxifying the body is the function of the liver. In fact, the custom of eating liver regularly, at least once a week, was common in Europe and the United States up to the middle of the twentieth century. Many peoples believed that eating the eyes of an animal, particularly an animal known to have keen vision, would help their own eyesight. There are many other examples, but the general idea was that eating a particular organ of a healthy animal would help the same organ in the human who ate it. Every traditional society who did this was careful to only eat healthy organs, from healthy animals. If the organ appeared diseased, or even discolored, no one would eat it. I make it a point to regularly eat liver, kidney, and heart from grassfed cows. I should mention that all of these organs seem to be functioning perfectly, and give me no discomfort or trouble. You can do this without much work, if you get the magnificent liverwurst from US Wellness Meats, which contains high-quality liver, heart, and kidney from grassfed cattle, in the form of a sausage that is very easy to eat. Sometimes the very best food is simple, and easy to prepare. Complex, difficult recipes with dozens of ingredients, and difficult methods may be impressive, but the results are often disappointing, and hardly anyone will actually make them. When you have great meat, simple is best. This old truth was brought home to me this Valentine’s Day, when two magnificent Delmonico steaks from U.S. Wellness Meats gave us an incredible meal, so good that no fancy recipe could even come close, in my opinion. This saying referred to the fact that truly great meat has a wonderful flavor, texture and tenderness of its own, which is often ruined or diminished when cooks do too much to it. A few simple ingredients and the right technique, combined in a way that brings out, rather than overwhelms the natural flavor of great grassfed meat, is ideal. And it can be very simple and quick to cook. The meat is the most important part of cooking a great steak. There are many cuts of meat that used to be popular in the United States that are almost unknown today, which is a shame. You never see a pin bone sirloin steak anymore, but they used to be very popular. A bone in New York steak, sometimes called Delmonico, after the first fancy restaurant to become famous in the United States, is also very hard to find. Fortunately, U.S. Wellness Meats, which sells great grassfed meat online, carries a grassfed version of this cut, with the wonderful, flavor-giving bone. The meat is grassfed, just like meat was fed in the nineteenth century, when Delmonico steak was created. I chose this for our Valentine’s meal. Why did I choose a bone in steak? The bone in this cut gives incredible flavor, as substances from the bone are released into the meat during the cooking. No spice, condiment, or oil can provide flavor like this. The steaks looked so good when they arrived, even frozen, that I decided to prepare them using the simplest of three recipes for Delmonico steak contained in my first cookbook, Tender Grassfed Meat, on page 85. (This recipe can be made with a bone in or boneless steak.) The recipe contains only four ingredients, besides the steak. I knew these ingredients and this method would bring out the natural flavor of the steaks, not overwhelm it. I thawed the steaks, and let them marinate for a few hours in a single, traditional ingredient. I added the other simple ingredients, melted some butter in a pan, and cooked them. Cooking time was exactly eight minutes. That was all. We were rewarded with a steak so good, so flavorful, so tender, that I would not trade it for the most expensive Kobe beef on the planet, cooked at the world’s top steakhouse. The bone and the fat in the nicely marbled meat created so much beefy flavor, it was so tender, and the simple traditional ingredients brought out the magnificent real taste of the grassfed meat, a taste all the spices and condiments in the world could never create, could never equal. That simple, easily cooked steak, was one of the best I ever had. Real pork lard, one of the most tradtional fats of all. Americans have been told that eating saturated animal fats will clog our arteries and kill us. We are told that we need to eat only fats made from vegetable oil, modern oils, such as corn oil, soy oil, canola oil, safflower oil, and other oils that could not even be made before the twentieth century. The truth of the matter is that fat from healthy animals eating their natural diet is very good for us, providing vital nutrients in the right proportion, and supporting the natural functions of our bodies. Modern vegetable oils have a huge imbalance of omega-6 fatty acids to omega-3 fatty acids. This imbalance contributes to many illnesses, and causes inflammation in many people. Our bodies have never tried to digest or use these oils before the twentieth century, because they just did not exist. These oils are often processed with chemicals, and subjected to pressures and high heat, which makes them even stranger to our bodies. Some of these oils stink so bad in their natural state that chemical deodorizers are used to hide the bad smell. Humans crave healthy animal fats, because we know instinctively that they are good for us. Most people think only of butter when they think of an animal fat they might use in cooking. Pastured butter is great, but there are many other animal fats that are great for cooking and eating. Beef tallow is one of the oldest human foods, used for cooking and added to all kinds of foods for countless thousands of years. In its real form, from grassfed animals, beef tallow is full of vital nutrients. It was traditionally used for every form of frying, with potatoes fried in beef tallow being a favorite food all over Europe and America. It was used to brown meat for traditional stews and pot roasts, to sauté steaks, and to baste roasting meat. It gives wonderful flavor. Vegetables roasted in beef tallow are crusty and caramelized, absolutely delicious. Grassfed beef tallow is one of my very favorite cooking fats, and I use it often. I consider it important to only use beef tallow from grassfed beef, as it has the proper balance of nutrients and tastes so much better. Pork lard has been so vilified that many people are horrified by the very thought of eating it. Yet real pork lard was once the most popular cooking and eating fat on the planet. Pork lard was used extensively for cooking in China, other Asian countries, Latin America, Europe, and the United States. 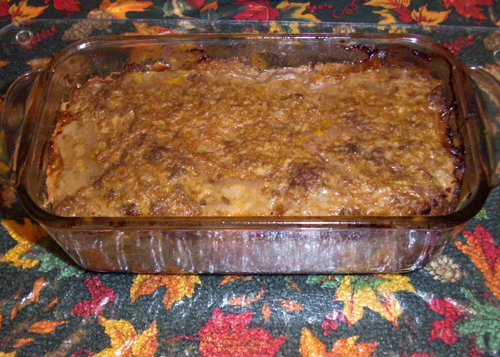 Many traditional American and European baking recipes make extensive use of pork lard. 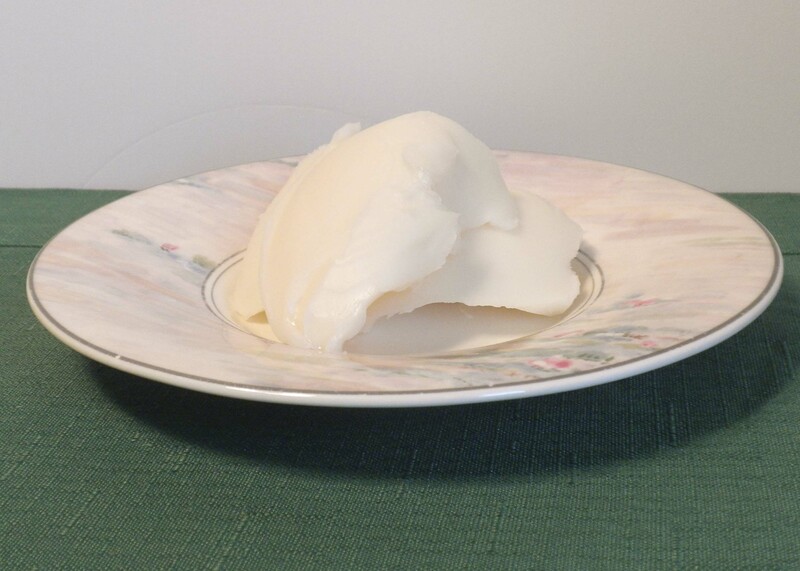 Pork lard has a very high smoke point, and is one of the easiest cooking fats to use, being soft even when refrigerated, and perfect for frying, sautéing, basting, and browning. It lends great flavor to food, and is very nutritious and easily absorbed by the body. You have to be very careful in selecting pork lard, because most of the pork lard sold in the U.S. is hydrogenated, which means that its very chemical structure has been changed by processing to increase its shelf life. I have knowingly eaten hydrogenated pork lard exactly once, and found it disgusting, with a terrible taste. Real pork lard, from pastured pigs, in its natural form, is wonderful. You can use grassfed lamb tallow for frying, sautéing , basting, and roasting. It gives incredible flavor. It is important to make sure that food cooked with lamb tallow is served hot, as congealed lamb tallow can feel greasy. Serve the food hot, and it is wonderful. Potatoes and other vegetables are particularly wonderful roasted in this fat, which lends a nutty, delicious flavor to food. It is also important to use lamb tallow from a meat breed of lamb, as the taste of the fat from wool breeds can be strong and not very appealing. But the flavor given by grassfed lamb tallow from meat breeds is unbelievably delicious. Bison fat was one of the staple foods of the Native Americans who lived on the Great Plains, being a vital component of their survival food, pemmican. Bison fat just may be the most nutritious of all, being full of nutrients from the strong, healthy bison. It is great for basting, frying, and sautéing. It gives a wonderful flavor to meat, unique yet wonderful. It is particularly good for sautéing at medium temperatures. Adding just a bit of bison fat to stews will do incredible things for the flavor. It is important that all of these traditional fats be grassfed or pastured. That way, you are eating the same kind of animal fat our ancestors have been eating since the beginning, and getting similar nutritional benefits. But where do you find grassfed beef tallow? Where do you find real pastured pork lard that has not been hydrogenated? Where do you find grassfed lamb tallow from a meat breed? 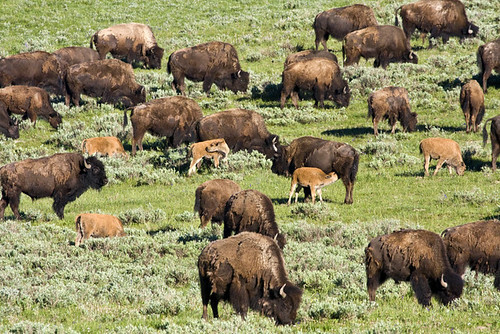 Where do you find grassfed bison fat? A local farmer may have any of these. But you can get all of them from U.S. Wellness Meats, which has done us all a great service by making these hard-to-get real animal fats available. The quality is superb, and I happily use all of them. Most Americans are horrified by the very thought of eating lard. Some seem to think that even a small amount of lard will stop their hearts, or make them obese, or both. Yet lard was once the most popular cooking fat in America. Lard was also the most popular cooking fat in China. Lard was demonized so margarine, hydrogenated oils, and other creations of the processed food industry would sell. The artificial fats created by the food industry taste and feel much worse than the traditional fats of our ancestors. This means that the only reason people would buy the factory fats is if real fats are believed to be unhealthy. There are no shortages of scientists and studies that the food industry could and can buy to scare people into giving up real food. Lard, and all saturated fat, was blamed for heart disease, and countless other illnesses. The truth of the matter is that real lard, from healthy pastured pigs, is very healthy and nutritious, and one of our best sources of vitamin D.
Real lard is one of the very best cooking fats, having a high smoke point, and being unlikely to spatter in most circumstances. And food cooked with real lard can be incredibly delicious. Nearly all the lard you will find in the supermarket is hydrogenated, which means that the very molecular structure of the fat has been changed to something that never appears in nature. This lard almost always comes from pigs that have been kept in confinement, may never see the sun, and are fed almost totally on GMO soy and GMO corn. This lard does not need to be refrigerated, which means that it has been processed to the point that it will not spoil. But lard like this has a horrid, greasy, slimy texture, and a truly disgusting taste, at least to me, and many others. It will, in my opinion, ruin any food cooked with it. Real lard, the lard enjoyed by our ancestors, is not hydrogenated. It comes from pigs raised in the open air, who forage for a great deal of their own food, and see plenty of sun. It is hard to find, but it tastes and feels a thousand times better than the hydrogenated abomination. You can get this kind of lard at some farmers markets, though it can be very expensive. My favorite Internet source is U.S. Wellness Meats, which sells rendered lard from pigs who spend most of their life in the open, foraging for a large part of their food. The price is also quite reasonable. Real lard gives incredible flavor to food. It is great for basting meats, and has been used for that purpose for thousands of years, from Sardinia to China. Meat basted with lard is more tender, retains more of its juices, and tastes fantastic. Real lard is also great for baking, and played a huge part in traditional European and American biscuits, pies, cakes, and breads. It gives incredible flavor and texture to these dishes, one that is unique and wonderful. Real lard is perhaps the best fat for frying and sautéing. It has a very high smoke point, spatters rarely, and adds its own wonderful flavor to the food that is cooked in it. We do not have French fries or fried chicken very often, but when we do, it is usually fried in real lard. It is the fat of choice in most of our stir fries. Not only is frying easier, safer, and smoother, but the taste benefits are immense. And real lard is healthy, to the great surprise of most people. The Weston A Price Foundation, which I consider to be the most knowledgeable food organization on earth, recommends the use of real lard in cooking. Not only does real lard provide a valuable balance of essential fatty acids, it is one of the best sources of natural Vitamin D, and other nutrients. Today, following the suggestion of a seventh generation English butcher, we fried eggs in real lard for the first time. Awesome. We use real lard in cooking all the time, and enjoy it immensely. This post is part of Monday Mania, Real Food Wednesday, Fight Back Friday, and Freaky Friday blog carnivals. A magnificent grassfed prime rib with a great fat cap and marbling. As food becomes increasingly industrialized, we are losing more and more of our ancestral food traditions. One of my goals is to try to preserve some of those traditions. 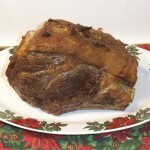 And one of the traditions I most want to preserve is the traditional prime rib roast. This tradition is thousands of years old, is absolutely delicious, and may have special nutritional factors. Yet, the tradition of the magnificent prime rib roast, once well known and popular throughout Europe and the U.S., is in danger of being forgotten. In fact, there are many people who do not even know what a prime rib is. What is a prime rib? Look at the photo above—that is a prime rib. A close look at this beautiful cut of meat shows what was once known as the king of roasts. This is a prime specimen, purchased from U.S. Wellness Meats, and they deserve great credit for this masterpiece. The roast rests on the natural bones, which impart great flavor, add nutrients to the meat, and act as a natural rack. 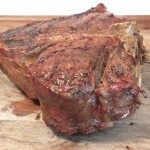 It is crowned with its own unique fat, which will provide wonderful flavor to the meat while making it tender and basting the meat as it cooks. The meat itself is divided into two sections, the large portion in the center, and a smaller portion on the front and top of the meat. These two cuts have different tastes and textures, which provide a wonderful contrast. Though grassfed, the roast is wonderfully marbled with little flecks of fat, which provide great grassfed nutrition, make the meat tender, and baste the meat internally as it cooks. I also love the flavor of vegetables roasted in the pan with the prime rib. Vegetables flavored by the melted fat and juices are unbelievably delicious with a flavor like no others. 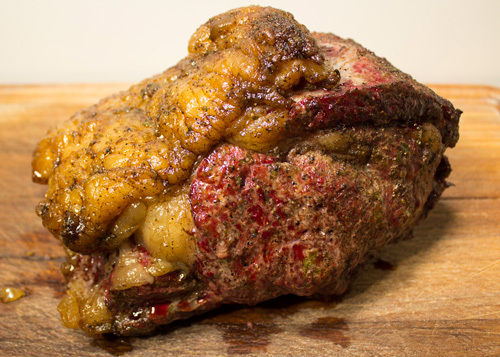 Prime rib has a unique taste that is brought out by roasting. It is hard to describe, but it is so delicious, and there is nothing else on earth comparable to it. I suspect, though I cannot prove it, that this taste shows the presence of a particular nutrient that I have found nowhere else. I do not know what this nutrient is, but I do know how I feel after eating grassfed prime rib. I feel rejuvenated and wonderful. And so satisfied. I can smell the presence of this taste about halfway through the roasting, and it makes me so hungry! The chine portion of an animal, which is where the prime rib comes from, has a long history and storied reputation. In ancient times, it was reserved for heroes and royalty. Irish legend records duels to the death for the right to claim this meat. The hero Achilles barbecued meat from the chine for the kings of the Greeks at the beach of Troy, as described in the Iliad. During the height of the British Empire, the prime rib as Sunday dinner became common, with leftovers forming the basis of meals throughout the week. Prime rib was once very popular in the U.S., as well. It should be noted that the prime rib eaten during this period was always from grassfed cattle, as factory meat did not exist until the twentieth century. It should also be noted that the chine portion, whether from cattle, lambs, pigs, goats, or bison, was always one of the most prized cuts of meat. It was always expensive, and always associated with strength and nutrition. The sight and smell of this magnificent cut of meat, roasted to perfection, with an aroma that creates hunger as soon as it is smelled, has brought great pleasure and wonderful nutrition to countless human beings. Yet the tradition of this king of roasts is in real danger of being lost. The modern food industry has done a lot to kill the prime rib tradition. The factory meat it raises just does not cut it, not in taste or nutrition, and lacks the unique flavor that makes prime rib so special. Even worse, the meat industry decided to do away with skilled butchers and to come up with easy to cut and package pieces of meat. The chine portion of most cattle, even grassfed cattle, is cut into thin boneless, fatless steaks. None of these steaks can possibly come close to developing the incredible flavor and nutrition of a real prime rib roast, which requires the bones and fat, and at least a moderate cooking period to develop the unique flavor. The anti-animal-fat phobia has resulted in most people wanting to buy meat with all the fat trimmed off, which will ruin any prime rib. In fact, meat with bones and fat is increasingly frowned upon by government regulators and the anti-fat fanatics, who would like to see it done away with. Cutting this portion of meat into thin steaks instead of cutting it into roasts has led to a huge price increase, which makes this meat difficult to afford. Most grassfed producers just cut the chine portion of their cattle into thin, boneless, fatless, steaks, which may taste good, but lack the real prime rib flavor. Fortunately, there are some exceptions. 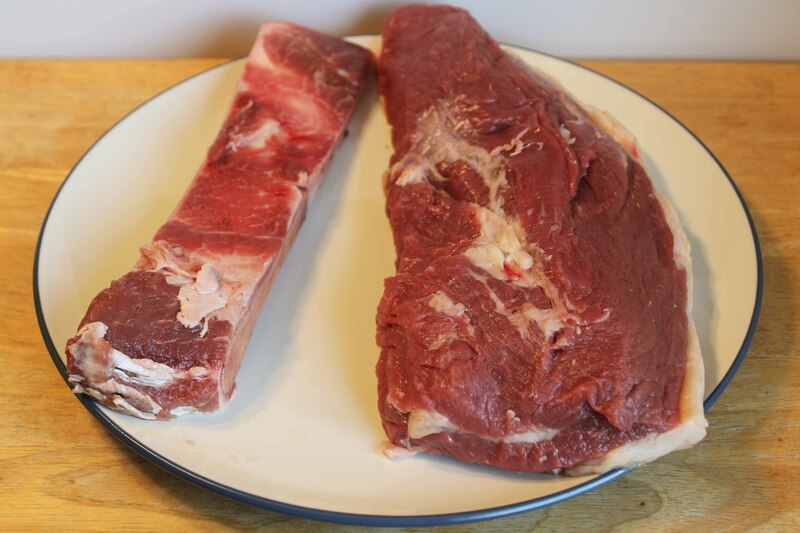 If you buy a whole steer, or a half or a quarter, you can usually arrange to have the rib portion cut into roasts, with the bones and fat left on. A few producers carry prime rib roasts at holiday times. I have a great local market that cuts grassfed beef to order. And as shown above, U.S. Wellness Meats sells excellent grassfed prime rib roasts. Make no mistake, grassfed prime rib is expensive. But you can still get a great grassfed prime rib roast for less than a restaurant dinner, and it will feed a lot of people. We do not have it often, but we will have it for special occasions, and enjoy the great pleasure and health benefits it brings. Both Tender Grassfed Meat and Tender Grassfed Barbecue have several recipes for the king of roasts, which can be very easy to cook. I submit that the tradition of the grassfed prime rib roast is well worth preserving. This post is part of Monday Mania, Fat Tuesday, Real Food Wednesday, Freaky Friday, and Fight Back Friday blog carnivals. Grassfed meat and bones, the most traditional and best food for dogs. The pack of wild dogs stalked hungrily through the tall grass, sniffing for prey. Suddenly, the pack leader stiffened as he smelled something. The pack froze, watching the leader. The leader bounded forward, and the pack followed, howling. They burst furiously out of the grass, and pounced upon a — patch of GMO soybeans? Sounds unbelievable, does it not? Well, so does a can of vegetarian dog food. But, believe it or not, I saw such a can recently, proudly marked as “vegetarian” dog food. Not trusting my eyes, I took a look at the ingredients. They included water (the first ingredient), soymeal, soybean oil, and a host of artificial vitamins. Oh yes, there was also some brown rice. Dogs are real big on brown rice. The ingredients were described as “natural.” In reality, this means that the soy was almost certainly GMO. Dogs are carnivores. They are designed to hunt prey and eat raw meat. Not soybeans, especially not GMO soybeans. Of course, dogs will eat this, if they get hungry enough. In fact, they will probably wolf it down, as their bodies search desperately for the vital nutrients that aren’t there. And just in case hunger is not enough, flavor-enhancing chemicals can be used to give a meaty flavor to this stuff. But that does not make it meat. Come to think of it, soymeal and soybean oil, highly processed to remove the stench and horrible natural taste, are added to all sorts of foods made for humans. While we are omnivores, replacing meat with soy is a bad idea for us too. In other words, processed soy is not fit for a dog—or humans either. Would You Rather Eat Grassfed Hamburger or Soymeal? The answer is very obvious, for most people. And almost all the people who would choose soymeal would do so because of their vegan or vegetarian beliefs, or because they are scared to eat red meat. But the reason that most humans would choose grassfed hamburger is because grassfed meat is one of the oldest and most traditional foods of humankind, a food that has nourished humankind for thousands of generations. In contrast, unfermented soy has been eaten for little more than one hundred years. And GMO soy did not even exist until the 1990s. All soy includes hormone-disrupting chemicals and other toxins, though traditionally fermented soy has much less. To say that grassfed meat tastes better than unfermented soy is like saying water is wet. And grassfed meat and fat are full of valuable nutrients, and are not toxic. This wonderful meat provides many nutrients that our bodies crave, and make us healthier and stronger. While the soy industry has planted all kinds of misinformation all over the Internet, trying to convince us that soy products have been eaten since the dawn of time, the truth is very different. Soy was first grown as a crop in China, thousands of years ago. This soy was not eaten at first. It was used to restore nitrogen to the soil, and would be alternated with food crops at various intervals. The fact that soy was not eaten or fed to animals tells us that the early Chinese knew it was not good to eat, as even this early, non-GMO soy had toxins, hormone disruptors, and smelled and tasted horrible. Eventually, the Chinese learned to ferment soy to make various foods. The traditional fermentation process reduced the toxins, and greatly improved the taste and smell. Even this fermented soy was only eaten in small amounts, and used mainly as a condiment and seasoning. I have often written about how grassfed meat can help people recover from all kinds of injuries, including physical ones. This applies to dogs as well as people. My friend John Wood, a terrific grassfed farmer and the founder of U.S. Wellness Meats, learned this firsthand about four years ago. John’s dog, Buck, was severely injured in an accident. The Vet found a severely broken hip, and did not think Buck would ever recover. John did not give up. He put Buck on a diet of raw grassfed meat, grassfed liver, and grassfed marrow bones. There was no surgery. John also gave Buck a very high-quality liquid calcium magnesium supplement. After three months, Buck was completely recovered. X-rays showed that the hip had healed completely. Does anyone really think that Buck would have been healed by eating canned soymeal? I know a number of humans, including myself, who have rebuilt their bodies and health by eating grassfed meat. So, I say that grassfed meat is fit for a dog, and humans, as both species thrive on it. I am not a veterinarian, and am not qualified to advise people on what to feed their dogs. But no one needs to be a vet to know that feeding dogs a vegetarian soy-heavy diet from a can just does not make sense.